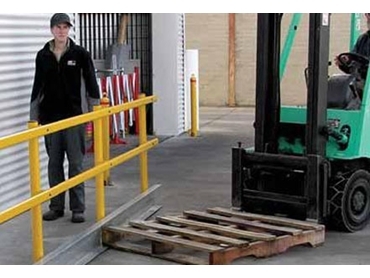 Barrier Group Pty Ltd presents the channel rail, a modular forklift separation system. Developed for one of Australia’s largest retail companies for use in their new ‘mega’ distribution centres around the country, Barrier Group’s channel rails were designed based on the client’s brief for a system that was completely modular, required no on-site welding during installation and needed only basic hand tools to replace damaged components. The primary objective of the channel rail system was to protect pedestrians from forklift tines on the site. Pedestrian safety is accomplished by using an outwardly facing galvanised channel measuring 200mm high by 6mm thick to trap the fork tines and prevent them from deflecting up and into the pedestrian traffic. The post and rails are powder-coated in safety yellow.